I was standing on the last corner at Paul Ricard for the French GP. I’d been shooting on the back of the track during most of the race but had this weird feeling that Randy Mamola, who was on fire that season, was going to do something on the last lap. I can’t explain it any better than that, I just had this feeling that he was going to do something crazy. So towards the closing stages of the race I moved back to the Virage du Pont corner, and waited for the leaders to come through. Eddie Lawson was first, then I waited for Mamola. And as he appeared, he did the most extraordinary thing. Instead of riding through and taking the chequered flag on the last corner of the last lap as any normal rider would, Randy ran straight onto the gravel. None of the marshals were watching because they assumed that he’d gone through the bend and were busy applauding the next rider. At first I thought he’d out-braked himself and was about to crash, but then from 60mph, Randy stood the YZR500 on its nose right in front of me, came to a halt, let the back rotate around to face up the track and then took off again to finish his race. I was so amazed that I only got off the one shot. Milliseconds before the Yamaha had been absolutely vertical. Lawson won and Randy rejoined the race to keep his second place, but I was absolutely gobsmacked. During a live race, Randy had performed the first stoppie that anyone had ever seen, on loose gravel, and third-placed Christian Sarron finished just two seconds behind Mamola! Randy pulled off that move and did so with the next rider breathing down his neck. When I got the pictures developed I had some prints made and showed Randy at the next GP, the British round at Silverstone. He was absolutely thrilled, he thought it was a fantastic shot and immediately showed his team manager, Kenny Roberts. And Kenny absolutely exploded. I was stood there when Randy handed him this picture and he just blew his stack, he went absolutely mad. “You’re fired!” he shouted in front of everyone. “I’ll see to it that you never ride for another team in another Grand Prix!” I was horrified, truly shocked. Kenny would break every rule in the book when he was a rider and nobody expected him to react like this. And all because of a picture that I’d taken. And yet I could see where Kenny was coming from. The team was Lucky Strike, GP racing was at that time becoming a far more serious business with big sponsorship money, and Kenny was answerable to Yamaha. They might well have lost that 2nd place had Randy fallen off doing his stunt. So he fired him then and there. By the next GP, Kenny had taken Mamola back on the team, but from that moment on there was a bad air between the two of them and Randy lost his ride at the end of the 1986 season. From Yamaha he went to Cagiva and played the clown, and Randy knew his Championship chances were over for him and the incident surrounding this photograph was the final nail in his racing coffin. If you’re going to pay someone an awful lot of money to ride something that costs an awful lot of money, you’re doing it to win and not to be the clown prince and monkey about. I was quite devastated at what happened, not least because I knew Kenny Roberts better than anyone in Europe at that time. We were good friends, and now I’d come between the two of them because of my picture. 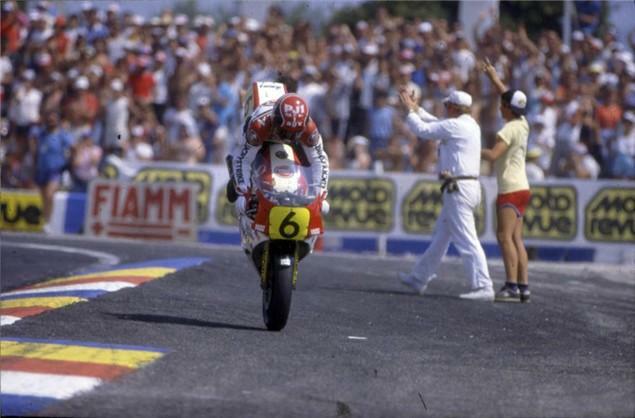 Randy Mamola was the best GP rider ever not to hace won a Championship. He was more than good enough, but to pull a stunt like that when he was riding so well was completely mad.